Last night I was invited at one of the university senior professor's place for dinner. It was mainly for business purposes, but it's not so often that Japenese invite you home. After 10 years there, hundreds of dinners at home, I can still count on the fingers the number of houses we've visited as guests!! Most people prefer to invite you at the restaurant. Last night host's hobby is fishing and he offered us a selection of unique fishes he fished on Tuesday for dinner. Something really delicious and fresh! The first one was slowly oven grilled sabre fish served with a little of soya sauce and rice. This fish has a very fine white flesh, juicy and it's shape and color make an simple beautiful plate. 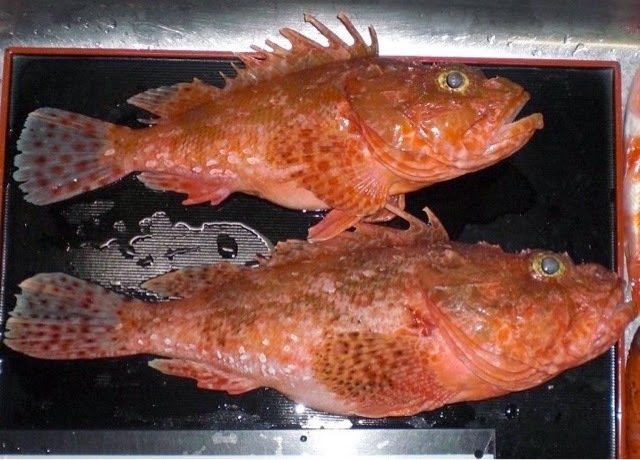 The other one, more exceptional is scorpion fish. A quite rare and difficult to catch fish. This very muscly fish has a very firm flesh very similar to the monkfish was served in a shabu-shabu style. Something like a hot-pot where you dip the slices of fish to cook it. Everything was home-made and delicious! Thanks for letting me discover these fishes!